Cast: Leonardo DiCaprio, Djimon Hounsou, Jennifer Connelly, David Harewood, Arnold Vosloo. Story: Diamond hunting in civil war-torn Sierra Leone. Running Time: 2hrs 23 minutes. 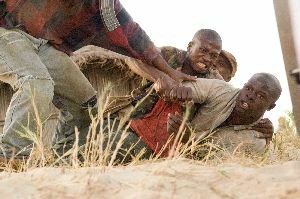 Blood Diamond is an uncomfortable mix of warring action and politics - it's a touch simple-minded but has enough bite to mask the faults. Mostly. Blood Diamond. Such an evocative title, isn't it? "Blood" referring to the pink tinge of the big diamond discovered by prisoner Djimon Hounsou and, at the same time, neatly encapsulating the war involved in their control. "Conflict diamonds", they're called - diamonds obtained by force. We're preachily told at the end that it's the consumer's responsibility to insist that a diamond is conflict-free, yet only an hour beforehand they told us how these diamonds become indistinguishable from clean ones. This kind of woolly thinking is all the way through Blood Diamond, so it's quite surprising that it still works. Leonardo DiCaprio takes the lead as a Rhodesian diamond smuggler and he's pretty good, but it's fisherman Djimon Hounsou (Eragon, The Island) who steals the show. After discovering a diamond worth more than his country, his life takes a series of dramatic turns as he searches for his family who were abducted by Sierra Leonian rebels. Along the way he helps Leo try to break his own world record for usage of the line "C'mon!" previously set in Titanic, and gets pretty close. There's a lot of nastiness in Blood Diamond. From the very outset we're shown quite how barbaric the Sierra Leonian bad guys are, and it's not easy to watch. At every turn, it appears that Leo and Djimon are about to succumb to these savages, but every time some remarkable coincidence saves them. It becomes tiresome after about the second time that the baddie is distracted at the exact split-second before one of our heroes gets the chop. It's lazy writing and there's no excuse for that. Compounding the problem are the magic bullets so often seen in shooty movies - the bullets that always miss the significant characters no matter how many are pinging off the scenery by their ears, bringing down extras by the bus-load. After a few of those, you just stop caring. So what's left then? The pace, I suppose. Despite being nearly two and a half hours long, it never slows down too much. There's rather too much trekking around, and far too much indiscriminate shooting, but I guess that was necessary to push the political point that drives the movie, and it does at least serve to hold your interest. The characters, although described by many reviewers as broad and rich, are anything but. Leo's the likeable rogue, Djimon's the whiter-than-white (!) hero, Jennifer Connelly is the saintly sidekick and love interest, and anyone in an army uniform is worse than Hitler. Where's the breadth, exactly? The more I look, the more bad points I pick out, but that's where reviewers fall down. Yes, there are many niggles, but you only see them if you're looking for them, so as an evening's entertainment I have no choice but to wholeheartedly recommend it. Blood Diamond is an action movie in political clothes. Riddled with flaws but still succeeding as a cohesive and compelling movie, you'll love it because you won't be picking it apart like I was. Testosterone Satisfaction Rating: 3/5 - gunplay a-go-go, several brutal moments of hackery and maimitude. To enjoy this film you should be: tolerant of displays of atrocity. 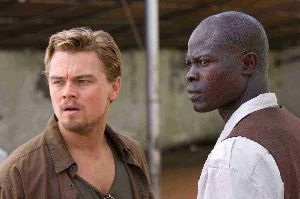 Blood Diamond was released in the UK on 26th January.